This is a sphere of creativity which, to our knowledge, has been little explored in relation to people with dementia. There are possibilities both for the craft activity of making the puppets, and the dramatic activity of performing with them. The latter would probably work best in terms of improvisation rather than the use of scripts. We think it would be really interesting to explore whether speaking through a puppet helps individuals to share their experience of dementia, tell others what they need and to help them to come to terms with it. 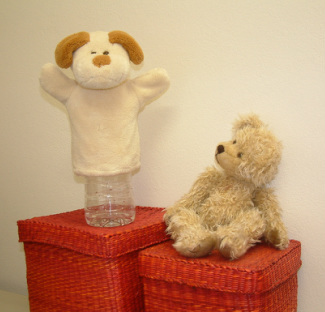 There are also obvious opportunities for using the interaction of puppets as an outlet for humour and play. He’s not smart. It’s the lady who put him there. He’s a person who stands for something else. This seems to be unique, the whole set-up of him. Whereabouts was it born, do you know? Thinking about a name? What is thought? Do you have asservations like that? I want to see if he misses me. For a long time now we have been thinking about having a place where people with dementia and their supporters can meet and enjoy all the benefits of engaging in creative activities - drama, painting, sculpture, dance, textile work - anything and everything! We thought of this idea about 10 years ago when driving through North Yorkshire where there are wonderful stone barns everywhere. They seemed to be calling to us to come along and renovate one and turn it into a welcoming and inspiring creative space. However, we pretty soon realised that this was probably too big a project for us to attempt. We have not forgotten about it, though, and we are still looking for somewhere that people with dementia and their friends and relatives, could spend a day or a weekend or a week to try out different artforms in comfort and peace. Ease of access, appropriate facilities, and friendly and understanding staff would be essentials. Artists would be on hand to encourage and guide and help to light the spark to ignite people's passions. Do you know of such a place or a sympathetic millionaire...?